As the excitement and anticipation of the holiday season nears, parents are already getting jumpy about finding the Leapster Multimedia Learning System that hits store shelves at the end of this month. LeapFrog Enterprises, a leading designer, developer and marketer of innovative technology-based educational products, created the Leapster platform as an educational game player, electronic book reader, digital art studio and interactive video player to provide an innovative approach to learning and fun by teaching essential school skills in ways that kids love to play -- with a cool-looking handheld electronic device. "The Leapster will be one of the holiday gifts that parents of 4-8 year-olds will be clamoring to find this year," said Jim Silver, co-publisher of Toy Wishes. "With its full-color screen and game console format, it will be a big hit with kids who love electronic games, art, video and books, while parents will love the Leapster's many different educational aspects. Once again, LeapFrog has developed an item that lets kids learn while they play." "The Leapster handheld features both a touch-sensitive screen and different function buttons for enhanced fun and learning," said Mike Wood, CEO of LeapFrog. "We believe that the Leapster platform is one of the most innovative products in company history." "The first time my child tried the Leapster several months ago, she was hooked," said Dr. Jillian Barrett. "Since then, she has been begging me almost daily to get her a Leapster, claiming that she 'needs it.'" Parents will be able to first purchase the Leapster Multimedia Learning System on October 30, with exclusive availability at Toys "R" Us in Times Square, New York City. LeapFrog will host an event that morning with a special presentation at the store. Engaging activities for children and parents at the event include appearances by SpongeBob and Dora, two of the Nickelodeon characters featured in Leapster software titles. 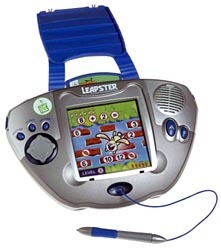 The Leapster system will become available at major retailers nationwide including Target, Wal-Mart and Kmart in November. The Leapster system was recognized by Toy Wishes as a HOT DOZEN selection at the Holiday Preview event today in New York City, following All-Star distinction in the Toy Wishes Holiday Guide. The Leapster system utilizes multi-sensory interactive experiences to provide children ages 4-8 years with personalized learning experiences that automatically adjust to their ability level. Each of the four key functions of the Leapster system -- educational game player, electronic book reader, digital art studio and interactive video player -- provides hours of opportunity for exploring new ways to learn valuable skills. With action-packed educational video games that automatically adjust to a child's ability level, the Leapster platform teaches essential school skills such as reading, math and critical thinking for pre-K through second grade levels. A variety of titles from the LeapFrog library will be vibrantly brought to life on the Leapster system with vivid animation and interactive games. As children play, they can learn literary skills and story comprehension while developing vocabulary and phonemic awareness. The Leapster system also transforms into a digital art studio that encourages creative thinking and imaginative expression. Dozens of art tools enable children to draw, write and create anything they can imagine right on the Leapster handheld. Step-by-step lessons build confidence and inspire new ideas. The Leapster system even takes video viewing to exciting new levels by enabling children to play built-in educational games while watching animated videos that develop fundamental reading and math skills. Children can stop the action at their own discretion when they wish to participate in the interactive full-color videos.